A brief update for July 2009. 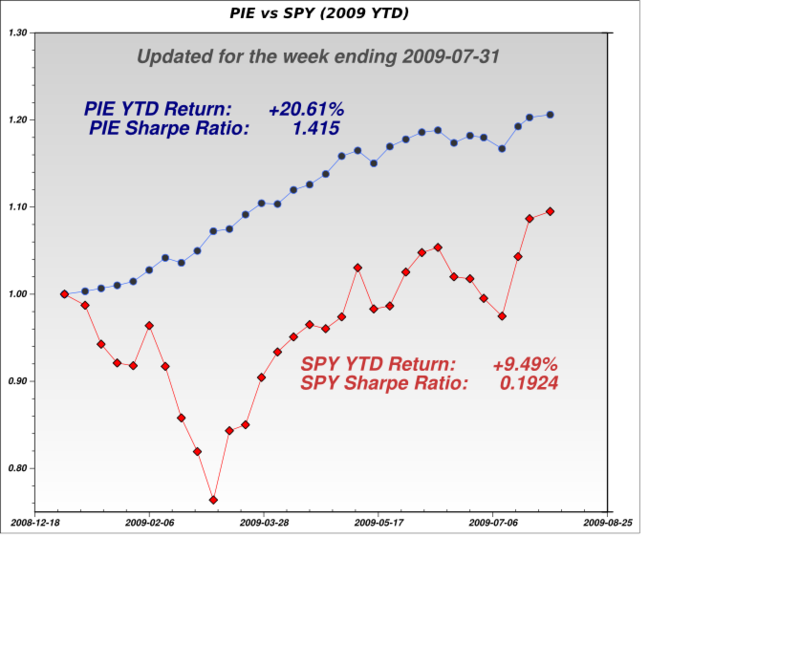 The chart shows the actual performance of PIE (real trading account, not the UpDown proxy) in 2009 (YTD) in blue, vs SPY (The SPDR S&P 500 ETF) in red. Samples are weekly samples. By digging through my old brokerage total balance records I managed to complete the missing 3 weekly samples from January, which were missing in previous reports. The 3 total-return weekly returns were: +0.3362%, +0.2280%, and +0.1751% while being just ~10% invested in PIE. January 2009, where I applied elements of the Short Term Contrarian Strategy to a very volatile market, was my best month by far in terms of return on investments, but I was not fully invested then. Since markets are now much less volatile, and generally trending up, I put less weight into pure short-term-contrarian approaches. The chart shows a complete 30-week weekly-basis record for the whole year. The very low exposure in January and addition of 3 samples to a total of 30 samples has lowered the overall Sharpe Ratio by about 10%. PIE has gained some strength in July compared to June ending up 2.22% for the month with 3 out of 4 weeks up. PIE greatly underperformed the US markets which had their best July since 1939(!). The good news is that PIE continued to nicely out-perform SPY on both an YTD-absolute and much more so on a risk adjusted basis. Overall for the year, PIE is now up +20.61% (YTD). Way ahead of SPY which is up 9.49% (YTD as of July 31). PIE has been up 24 out of 30 weeks YTD, with only 6 down weeks Since Dec 31, 2008 and not a single down month. The worst weekly draw-down for PIE was -1.25% vs -8.21% for SPY. The draw-down ratio is 1 to 6.568 in favor of PIE. My wild-guess for a rough July has turned out wrong. PIE's strategy is not to try and predict what the next month returns would be. Since PIE is mostly market neutral it is expected to underperform in up markets, and outperform in down markets. I still have a few significant improvements in the works for PIE and hope to keep outperforming the markets on a risk adjusted basis for the rest of the year.